Brighton can be quite a brash, loud and colourful city. It is a place where people express themselves without fear of judgement or prejudice, where they are proud to shout about who they are and what they represent. This is one of the many things that makes the city such a special place, and I wouldn’t change it for anything. 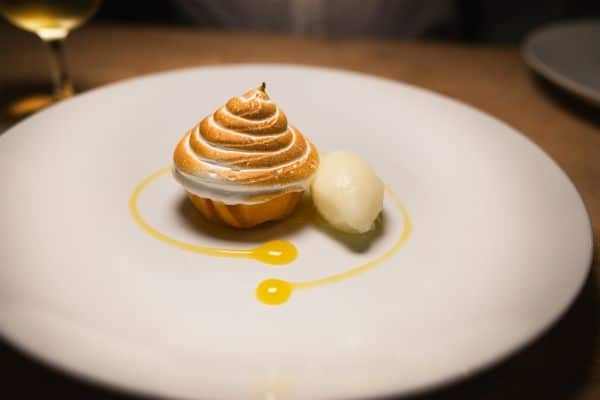 In the battle to make yourself heard it is often those that shout loudest that get the most attention, and this is a strategy that some chefs and restaurateurs employ to get noticed. 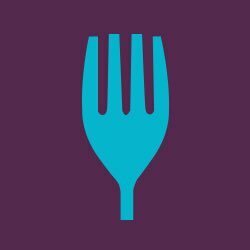 The restaurant scene in Brighton is becoming increasingly competitive, and a creative and strong marketing and social media presence can do a lot to help get ahead of your competitors. This is fine by me, provided you have got the skills to back up your claims. In a loud world, where everyone is vying for your attention it can often be the quiet ones that get overlooked, but that would be a mistake. There is a reason they say you should watch out for the quiet ones, and that is because they know something you don’t. They know that if you truly deserve attention you will get it, because quality always shines through in the end. If there is one restaurant that fits the role of Brighton’s quiet one perfectly it is The Little Fish Market in Hove. Since it opened in 2013, head chef Duncan Ray and front of house Rob Smith have created a restaurant that this city can be proud of. They are the only restaurant in the city to hold three AA rosettes and are tipped to be one of the first to receive a Michelin star. They have done all this without creating unnecessary noise or attention and often under the radar or many Brighton residents. Going to eat at The Little Fish Market is always a pleasant experience, and I recently paid them a visit on a chilly Tuesday evening. Having recently recovered from a nasty cold, which had rendered my taste buds useless, I was looking forward to treating them to something special. Upon arrival, I was greeted by the effortlessly welcoming presence of Rob. His professional and warm welcome is the first piece of the puzzle that makes The Little Fish Market one of Brighton’s best restaurants. After being welcomed into the space, the homely intimacy of the restaurant instantly puts you at ease. The restaurant is only small, about 20 covers, but the tables are well spaced and lit. It feels familiar and comfortable, there is nothing ostentatious or authoritarian about the dining room. Taking our seat, we get our first glimpse at the menu. Each evening there is a single set menu that Duncan has created from what his suppliers have brought in and what is in season. This allows the diner to relax and settle into their evening, no pouring over a menu and agonising over choices. There is an excellent wine list to choose from, but we opt for the suggested wine flight giving ourselves over entirely to Duncan and Rob’s control. There are five courses on the board but we are brought some canapes first to whet our appetite. 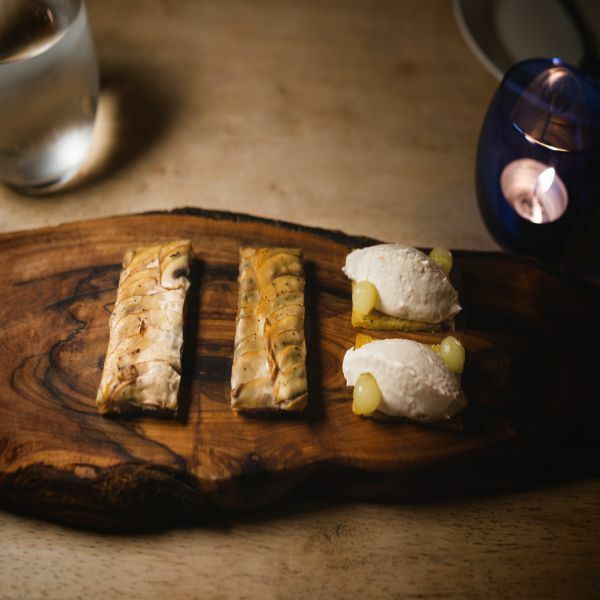 A herby mushroom tartlet is earthy, moist and moreish followed by a delicately light smoked mackerel pate juxtaposed expertly by pickled cucumber. It is just a taste of things to come and sets the meal in motion. 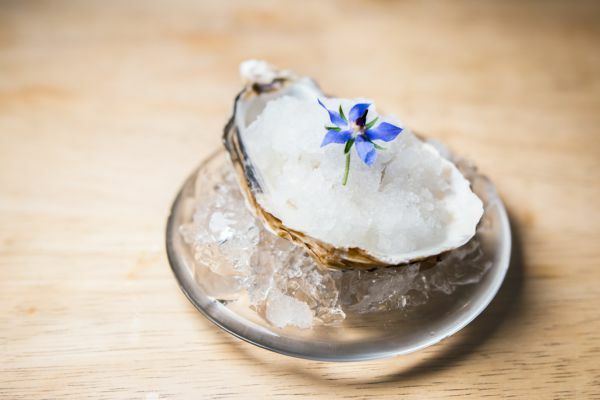 Our first course is an elegant combination of baked Carlingford oyster, Jersey cream and an elderflower granita. 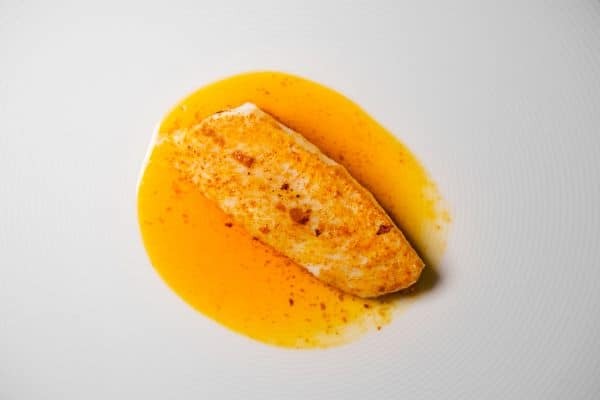 This visually striking dish balances the essence of the sea with a breath of floral citrus notes and a creamy silkiness. Close your eyes and you could be transported to a coastal clifftop field on a fresh spring morning. Matched with a delicate Cavit prosecco the bubbles refresh your palette and bounce playfully around your mouth. 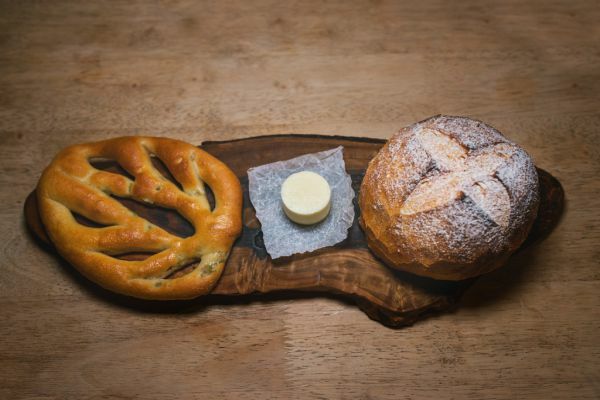 This is followed by freshly baked bread and an olive fougasse, served with butter that is made on site. The breads are both accomplished examples that we slowly pick at whilst thinking about our next course. Brill in a paprika butter arrives shortly after, matched with a Villa Wolf dry Riesling. The firm flesh of the fish provides the perfect foil for the buttery and pepper hot paprika sauce that accompanies it, transporting us to an exotic yet familiar place. This simple and understated cooking epitomises Duncan’s style. There is nothing else on the plate, because there doesn’t need to be. Plates cleared we are gently navigated toward our next course of crab ravioli served with monk’s beard and a bouillabaisse sauce. Another elegant and visually stunning dish it delivers on many levels. 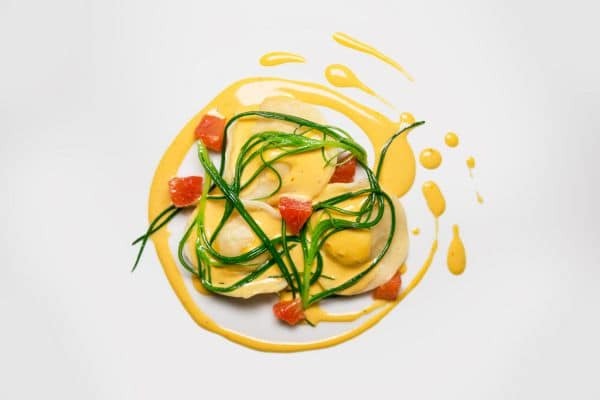 The sweet crab ravioli is impeccable in its execution, the complex sauce adds depth with the citric zing of blood orange bringing a freshness to everything. This is paired with a delightful berry fresh Villa Wolf pinot noir rose. 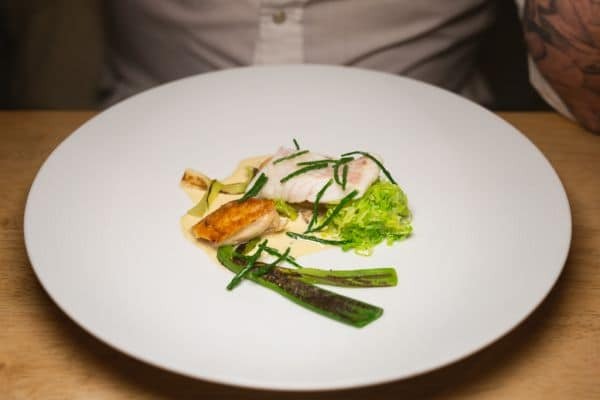 The monks beard is a delicate shoot, likened to samphire, that is grown in Tuscany and this dish had all the artistic sophistication of that part of the world. Our final savoury dish combined turbot with chicken, mushroom and sherry in a polished example of fine dining at its best. Beautifully presented, the dish balances the meat and fish elements with a delicate touch and fresh vegetables add texture and colour to the plate. A glass of Pouilly-Fumé from the Loire valley matched the classic origins of the dish wonderfully. With just the dessert to go we felt a sadness that the meal was coming to an end, but the quality of the dessert soon handled that. 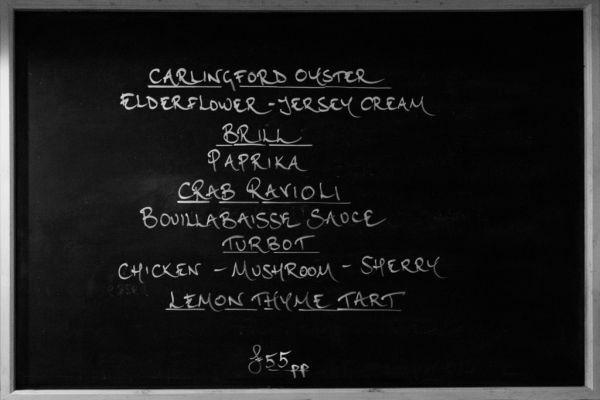 The board simply said “Lemon thyme tart” but what came from the kitchen was much more. The lip smackingly tart lemon filling is topped with the most creamy and luxurious Italian meringue I’ve eaten. This was encompassed within a single layered crisp base unlike any tart I’ve previously eaten. Playful, sweet and invigorating the dessert was a fine end to an exceptional meal. The Little Fish Market is a restaurant that Brighton should be very proud of. The food is of a standard that few others in the city come close to reaching, and the service and atmosphere is second to none. This is food that oozes confidence and elegance without being the slightest bit elitist or exclusive. Duncan is a chef who understands flavour and every dish has been created with the experience of eating in mind. Nothing appears on the plate that shouldn’t be there, and the chef clearly has no desire to over complicate a dish for the sake of it. 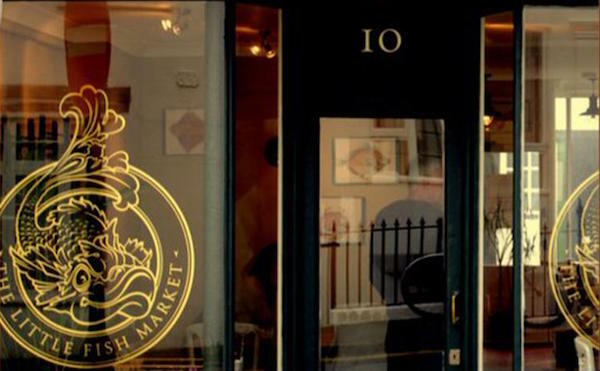 If you are a looking for one of the best dining experiences in Brighton then The Little Fish Market should be at the top of your list.